This still from an animated fly-through of the new universe map created by the Sloan Digital Sky Survey-III shows the positions of galaxies mapped in 3D space. 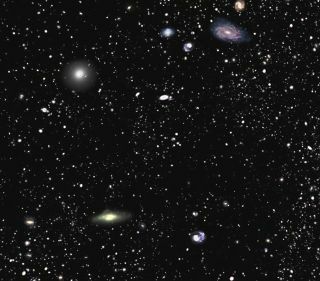 The largest 3D map yet of the universe's huge galaxies and bright black holes may serve as a springboard toward solving some of astronomy's greatest mysteries, its creators say. David Schlegel of Lawrence Berkeley National Laboratory in California said this kind of atlas could help scientists get to the bottom of perplexing mysteries such as the invisible, untouchable dark matter and dark energy that seem to be rampant in space. "Dark matter and dark energy are two of the greatest mysteries of our time," Schlegel said in a statement issued with the map's release. "We hope that our new map of the universe can help someone solve the mystery." The new data come from the Sloan Digital Sky Survey III (SDSS-III), and they include measurements from the ongoing SDSS-III Baryon Oscillation Spectroscopic Survey (BOSS), which calculates the distances to galaxies as far as 6 billion light-years away and humongous black holes that lie up to 12 billion light-years from Earth. The SDSS-III project publically released a large amount of its data, including the map, for use by astronomers around the world in their own studies. "Our goal is to create a catalog that will be used long after we are done," said Michael Blanton of New York University, who led the team that prepared the data release. The release contains photos of 200 million galaxies and spectra (measurements where an object's light is split into its constituent wavelengths) of 1.35 million galaxies. "We want to map the largest volume of the universe yet, and to use that map to understand how the expansion of the universe is accelerating," said Daniel Eisenstein of the Harvard-Smithsonian Center for Astrophysics, the director of SDSS-III. Scientists think the prevalence of dark energy in the universe is the force causing space to accelerate in its expansion to a greater and greater volume.